New data from the Japan Student Services Organization (JASSO) shows that international student numbers in Japan have increased for the sixth year in a row. There were 298,980 foreign students in 2018, compared with 267,050 in 2017, an increase of 12%. The international students contributing to the growth include those studying in Japanese graduate schools, universities, junior colleges, colleges of technology, professional training colleges, Japanese language institutes and university preparatory courses. Japan’s goal is to enroll 300,000 international students by 2020, and with steady growth continuing through 2018 they will now almost certainly meet that target. In 2018, the majority of Japan’s international students were enrolled in higher education institutions (208,900), and this sector experienced 10% growth from 2017 to 2018, the same rate of expansion observed in 2016/17. Undergraduate courses are the most popular, with 87,800 enrolled (30% of all higher education students). Another 67,475 students were in professional training programmes (up 15% over the previous year) and 50,100 in graduate-level courses. Japanese language institutes also experienced significant growth (14.5%) from 2017 to 2018, with 90,080 foreign students enrolled in 2018. 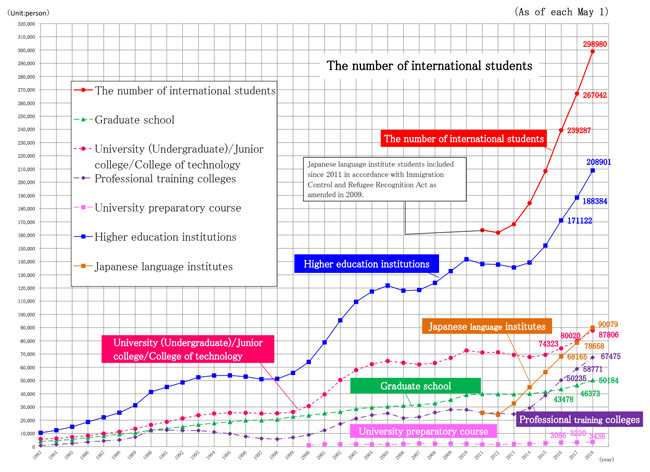 Cumulatively, from 2013 to 2018, the growth rate of international students in Japan is 78%, which averages out to approximately 13% per year, an impressive record. The vast majority of Japan’s international students in 2018 were from Asia (93.5%) with 3.5% coming from Europe and 1.1% from North America. Nearly two-thirds came from only two countries: China (38.5% of the total, sending 114,950 students, up 7% over 2017) and Vietnam (24%, sending 72,355 students, and up significantly – 17.5% – over 2017 following 14.6% growth the previous year as well). Rounding out the top five most important sending markets for Japan are Nepal (8.1% of the total, sending 24,330 students and up 13% over 2017 following 10% growth the previous year as well), South Korea (5.7% of the total, sending 17,010 students and up 8%), and Taiwan (3.2% of the total, sending 9,520 students, up 6%). Notable jumps have occurred in the number of Sri Lankan students (from 6,610 in 2017 to 8,330 in 2018, a 26% increase) and students from Myanmar (from 4,815 in 2017 to 5,930 in 2018, a 23.5% increase). And Bangladeshi student numbers grew by 33%, from 2,750 in 2017 to 3,640 in 2018. Nearly half (47%), of all international students in Japan in 2018 were studying in the humanities with the next most popular field social sciences (25%). The next most popular field is engineering, accounting for 11% of international enrolments in Japan. Fully 96% of foreign students studying in Japanese language institutes are from Asia. In 2017, Chinese students outnumbered Vietnamese students in these institutes by a narrow margin, but in 2018, there were slightly more Vietnamese (30,270, 33.5% of the total) than Chinese (28,510, 31.5% of the total) studying Japanese in Japan. The number of Vietnamese students in these institutes grew by 4,090 from 2017 to 2018, while the number of Chinese grew by only 755. Nepal also sent significantly more students for Japanese language studies in 2018: 2,350, for a total now of 9,000 students (10% of the total). This entry was posted in Asia, Japan, Regions and tagged foreign students in Japan, international students in Japan, .